I have been procrastinating about this blog post because I just haven’t been sure what to write about or what to say. There are no more photos of beautiful Bahama beaches, clear warm water, and sunsets and sunrises. This is a different phase of the adventure. 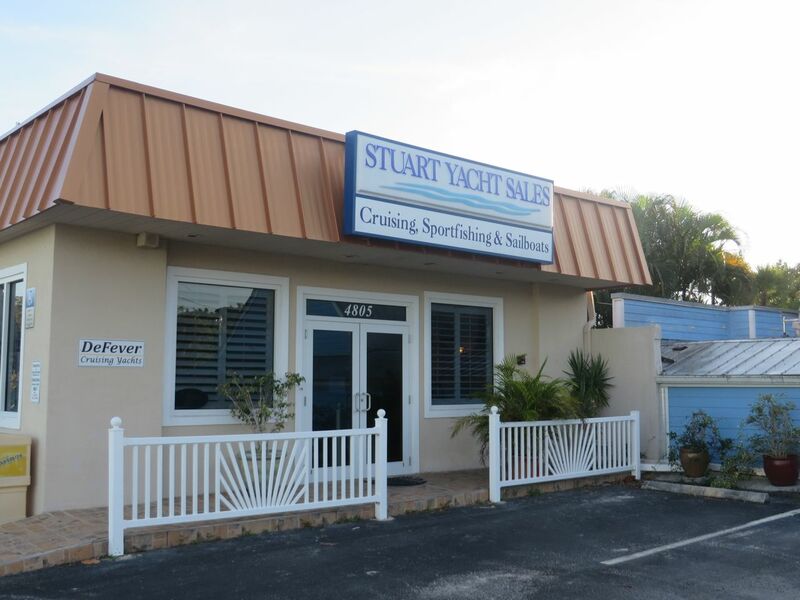 When we left Fort Pierce we traveled south down the ICW to a little place called Manatee Pocket in Port Salerno which is next to Stuart, Florida. 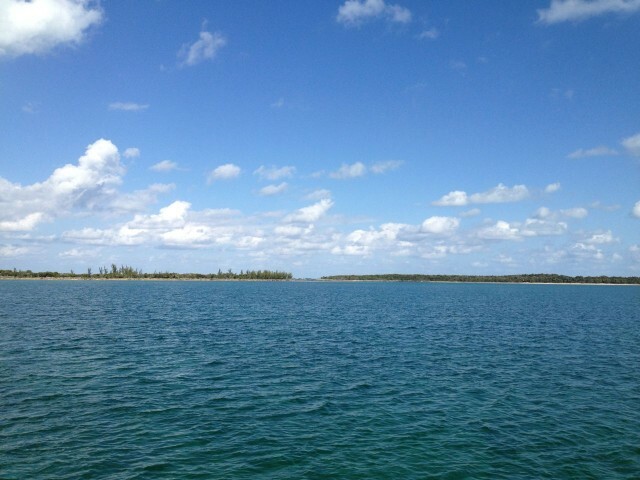 Manatee Pocket is a small (surface area of 0.5 square miles), shallow bay-like area located where the St. Lucie River meets the Indian River Lagoon. The junction of the Okeechobee Waterway and the Atlantic Intracoastal Waterway as well as the St. Lucie Inlet are located in these waters, a real “water intersection.” This convenient waterway access makes Manatee Pocket a good location for marine-related industries, commercial and recreational fishing; as well as a jumping off or return point for the Bahamas or crossing the state by way of Lake Okeechobee. 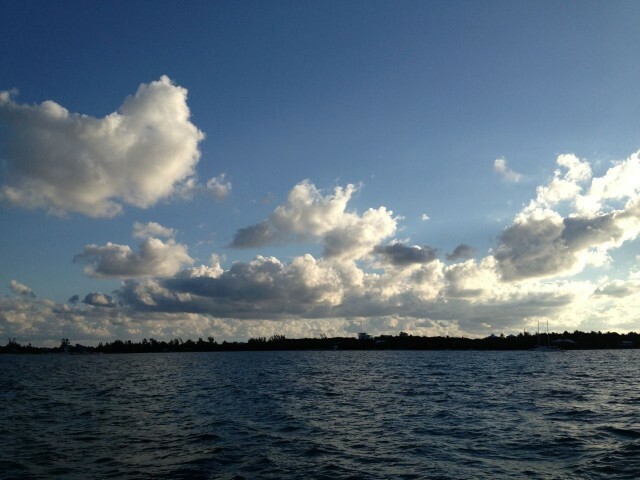 Overview of Manatee Pocket. 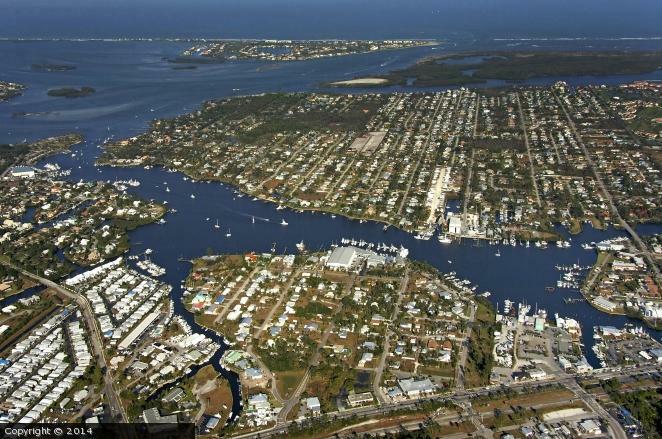 At the top of the photo you can see the St. Lucie Inlet. We have spent a few weeks in Manatee Pocket at the Stuart Yacht Sales dock, and we will be leaving Kindred Spirit here in Florida when we both return home to Connecticut. She is now for sale. That is very hard for me to write. 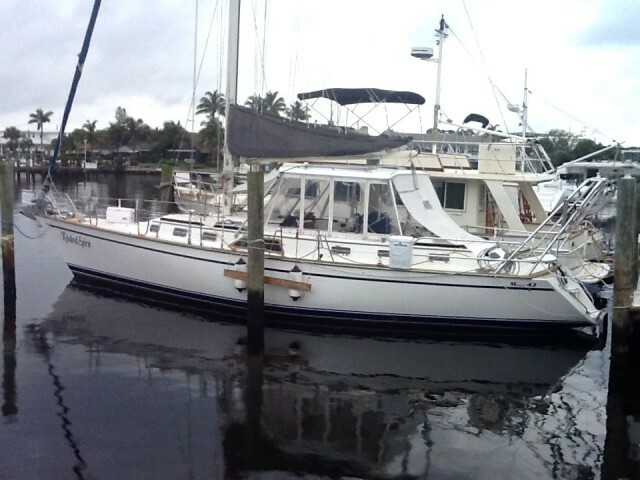 We have owned this Morgan 43 foot center cockpit sailboat for 12 years and she has been our home for 6 months. For over a year we have discussed making the transition from sailing to a trawler, mostly because of my health (ovarian cancer and lymphedema in my leg) and our age as we look ahead. I’m so glad we made this trip to the Bahamas on Kindred Spirit, She was fully equipped and ready for the voyage. She handled everything that came our way, safely and comfortably. We could not have asked for more. 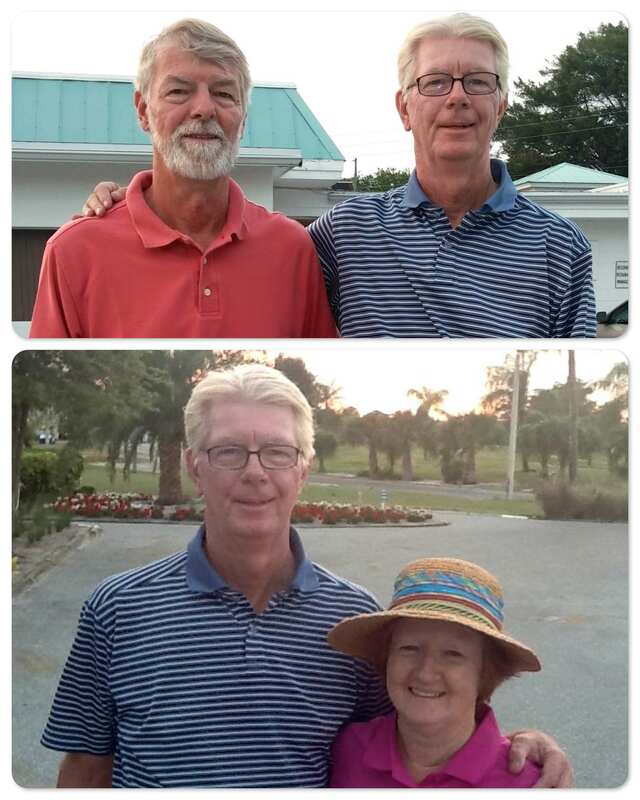 A truly pleasurable bonus to this is spending time with Al’s brother, Bill and his wife, Barbara. 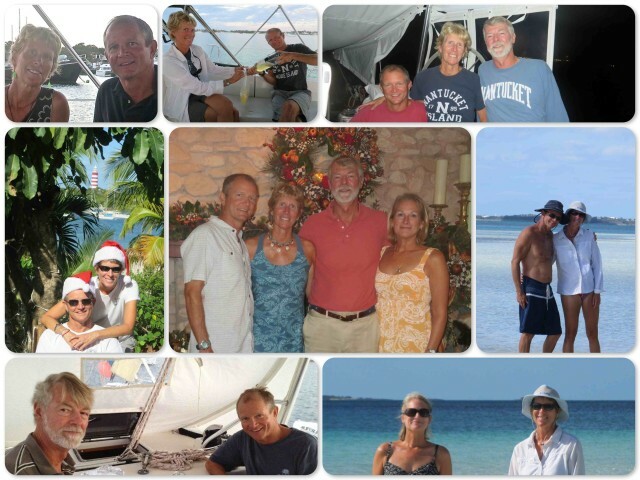 ~The Watson brothers – just can’t take them away from boats and salt water! Life at a dock isn’t the same as swinging on a mooring or at anchor in the Bahamas, but it is a good place for all of the cleaning, emptying and boxing that we have to do now. Our dock home is a funky little spot with a bar (karaoke night on Thursdays) and a collection of shops and art galleries. Our pelican friend greeted us as we pulled into the dock. ~The one on the left adorns a wall among the galleries. ~ The taking heads still believe the things they report are “news” and the real news is more of the same. 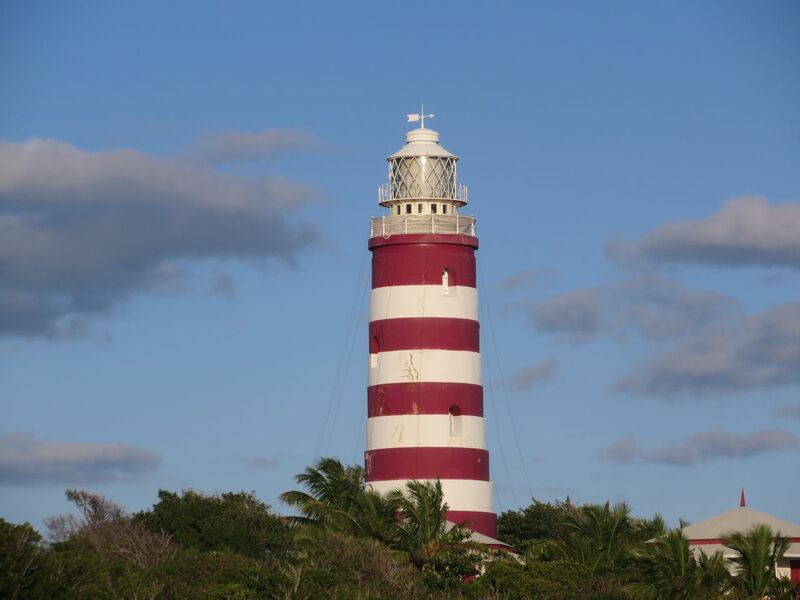 It just made us miss the Abaco Cruisers VHF Net even more!! 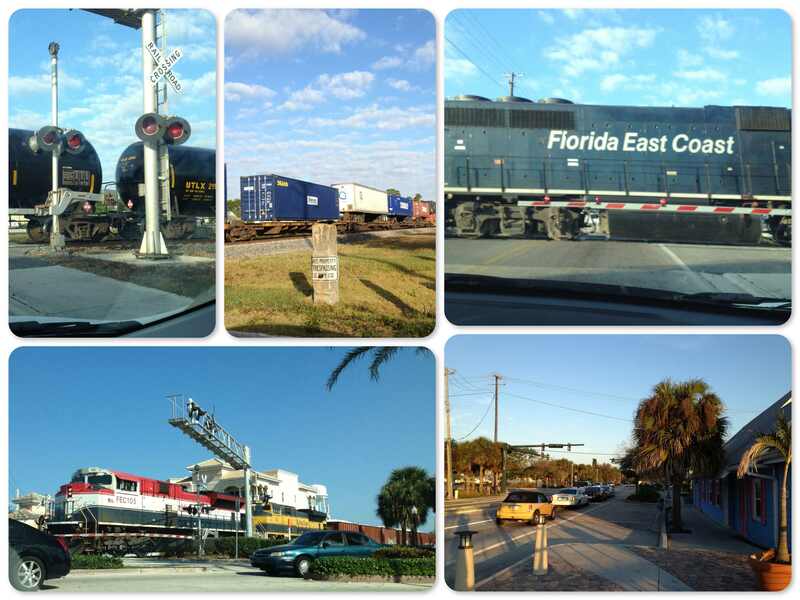 Trains and traffic! The noise from the trains and the speed of the traffic has been a bit unnerving. It will take some time to adjust to the pace in the U.S. again. A barge and dredger!! Yes, it was that close to us!! There is a good side to being back home in the U.S. – convenience. 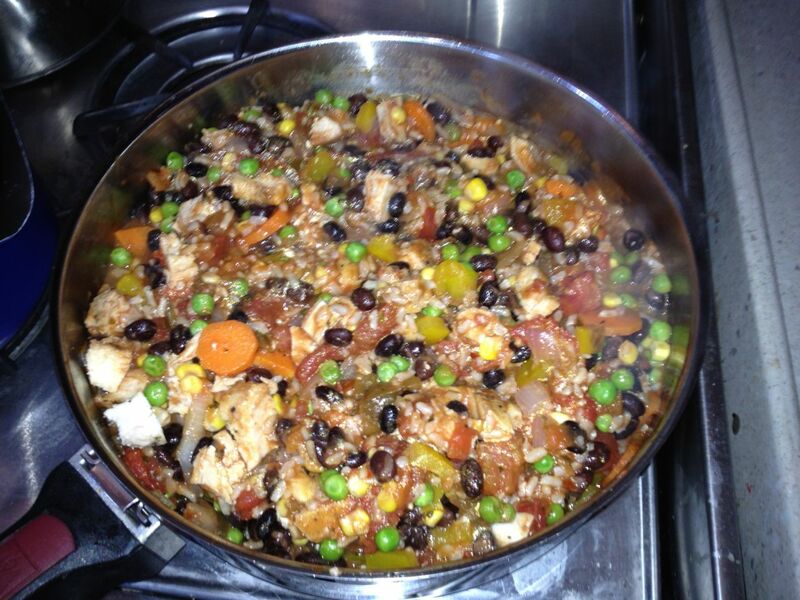 Any store you want or need – Publix the grocery store, Home Depot, Lowe’s, West Marine, and more. 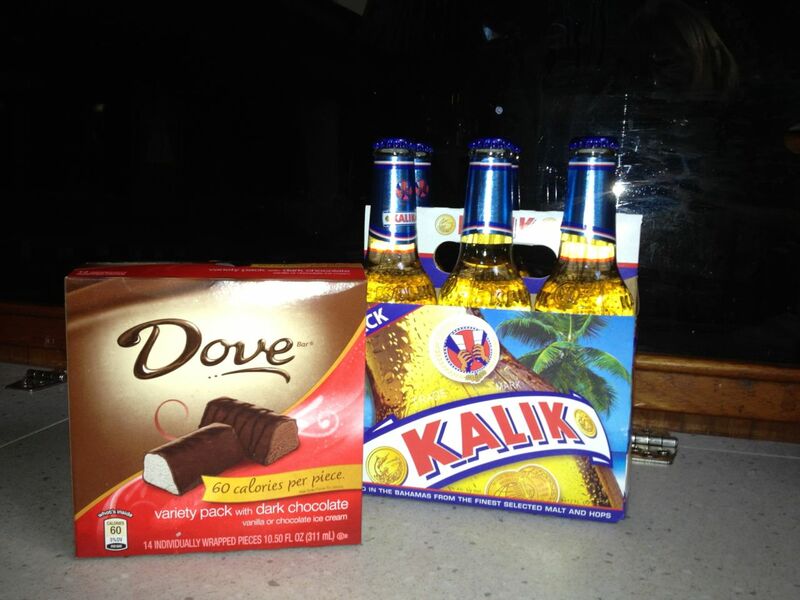 We bought a box of Dove mini ice creams, our favorite indulgence; and a 6-pack of Kalik, the Bahama beer. Ahhhh, the best of both worlds! 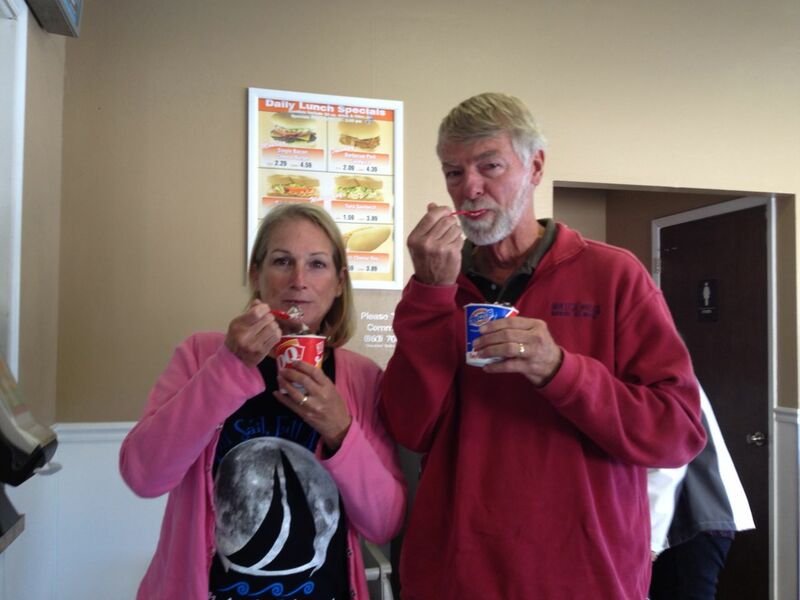 Our first Dairy Queen Blizzards in over 6 months!! 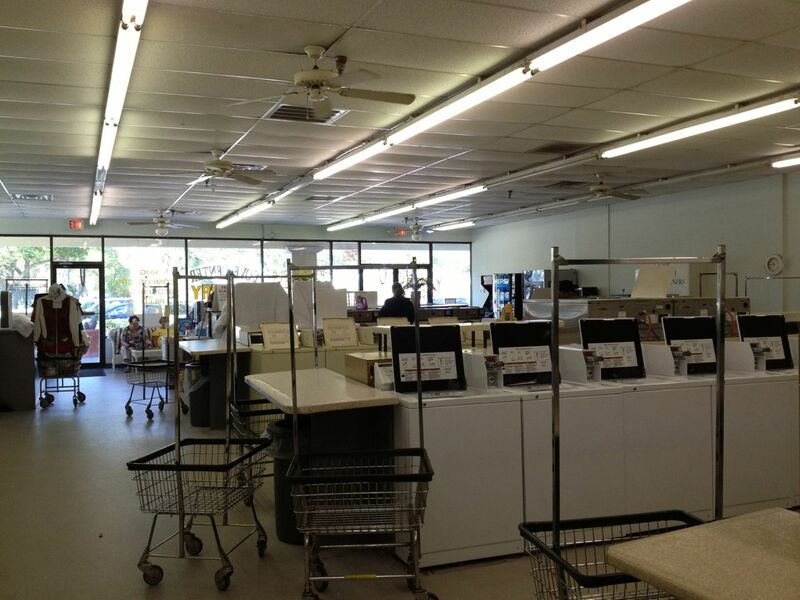 I spent quite a bit of time in this laundromat. It cost me $10 here to wash and dry what would have cost $50 back in the Bahamas. 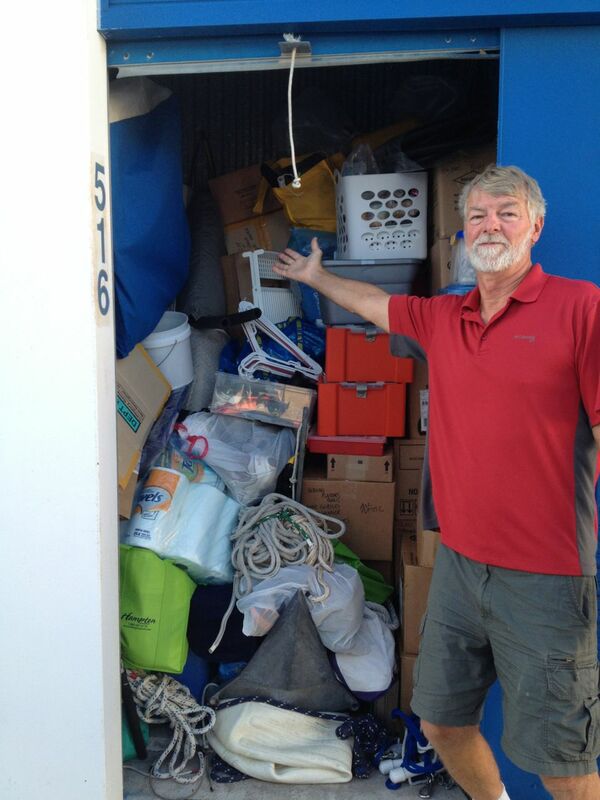 Al shows me the storage unit – see, it all fit. Hmmm. I never really used all of the canned and nonperishable foods, but I have an excuse! 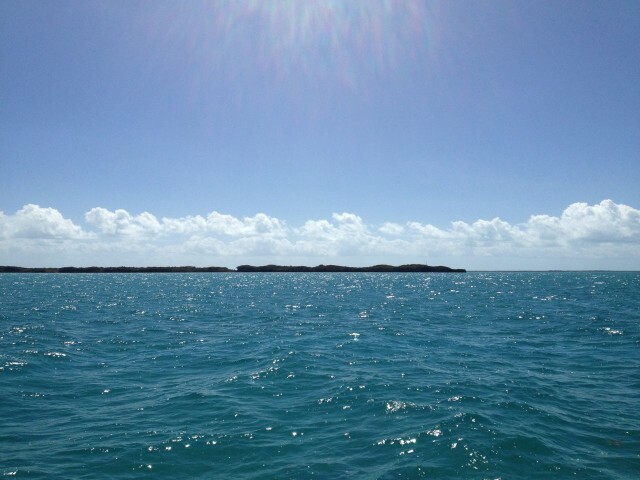 We ended the trip earlier and we never went to the more remote Exumas. 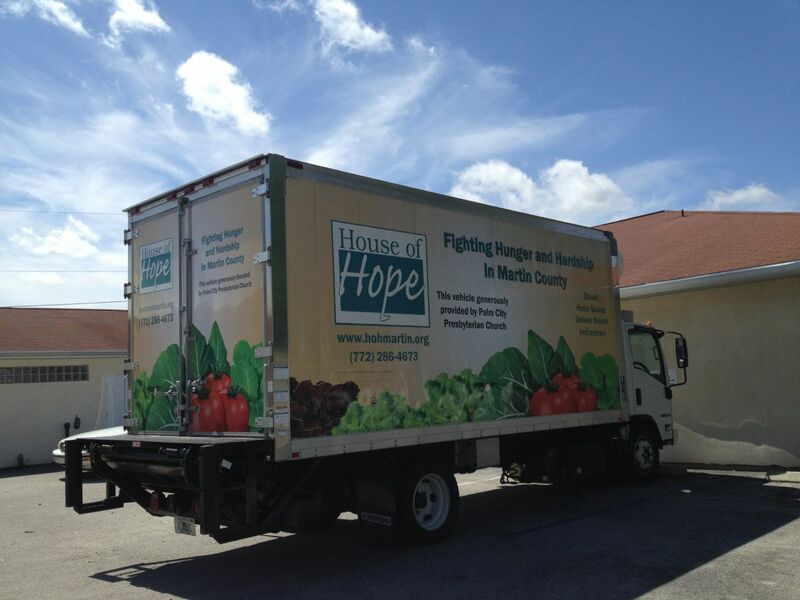 We donated a couple of boxes to the local food bank, House of Hope. 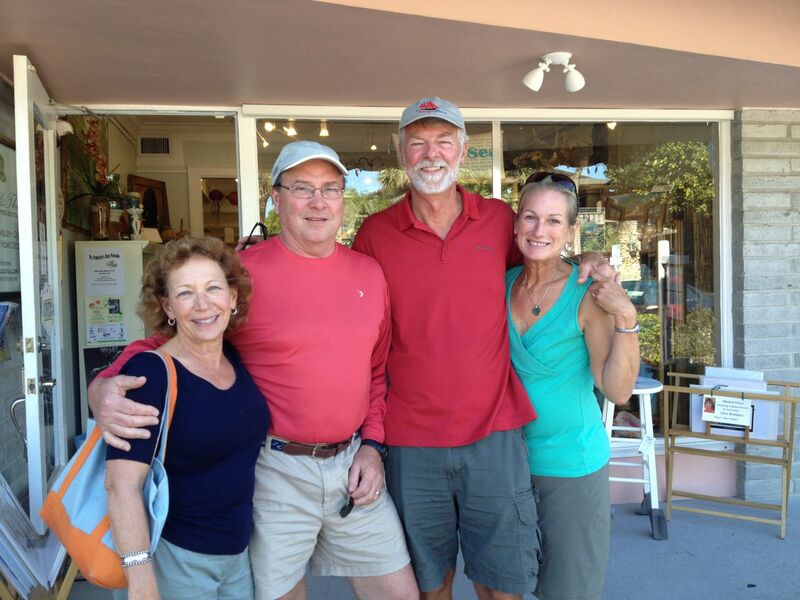 We took a break from the unloading and packing and drove to Vero Beach to visit our CT SYC friends, Dean and Mary Jo. They are escaping the cold New England winter and spending March and April in a lovely condo there. We really enjoyed our time with them. 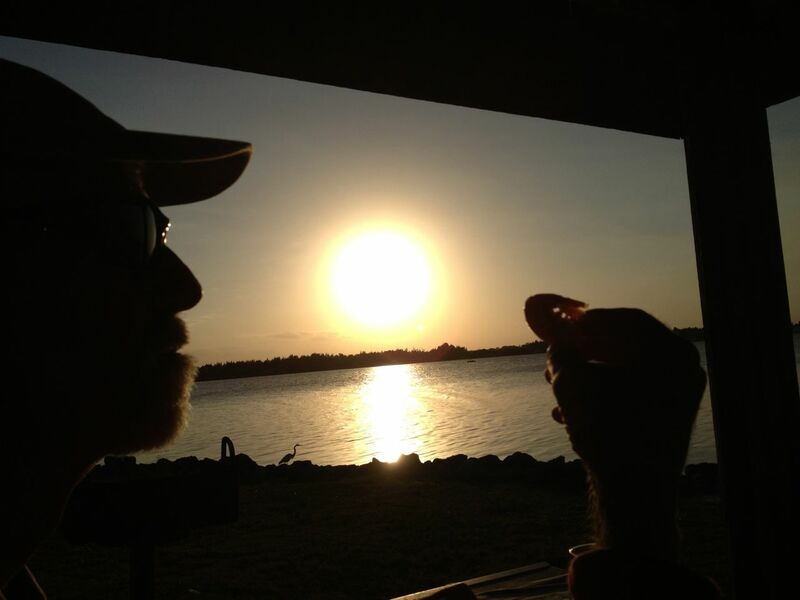 We had a sunset picnic in Vero. Al is about to bite into his shrimp. After two weeks, the end was in sight. 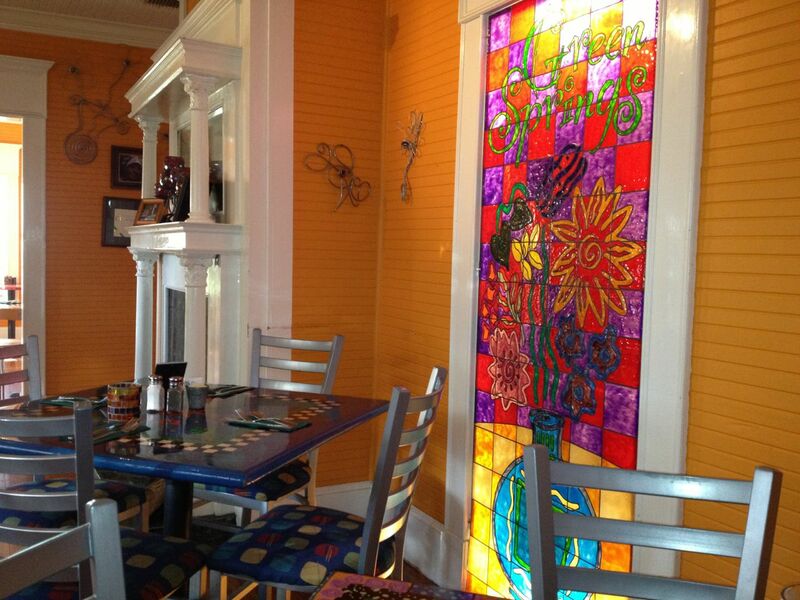 I took a flight home so that I can get the house ready and attend the baby shower for our next grandchild. Al will finish up and drive himself and our belongings back to Connecticut in a one-way rental truck. After six months of togetherness 24/7, it seems strange to be apart. So, the big question is……. what’s next? I don’t know, and that’s ok. We will figure it out as we go. This has been an incredible experience that leaves us with memories that we will treasure forever. The end of this post has to be a tribute to our very special and unique Kindred Spirit. We will always be sailors at heart, and this Morgan will carry a piece of us with her wherever she goes. I just hope there is someone out there who will love this boat as much as we have. It is really all about the weather. 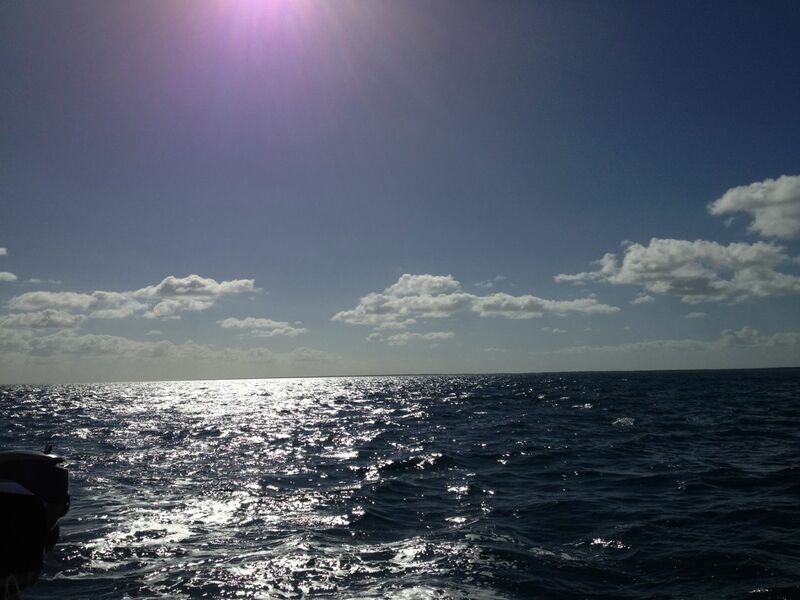 A good crossing weather window looks like this – winds below 15 knots, from the south or southeast/southwest and definitely not the north, with seas that are no more than 5-6 feet, preferably 4 or less feet. We had been watching and listening to the weather forecasts and determined that Saturday, March 1st through Tuesday, March 4th looked like a good stretch. 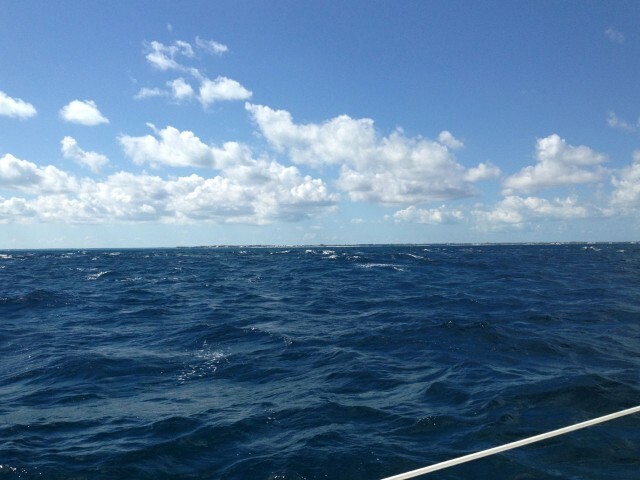 After Wednesday, SailFlow forecasted very strong winds from the north. If we were to miss this window, we might have to wait a week or more for another, or so they say. Naturally, with the typical accuracy of weather forecasts, those strong winds have not developed. 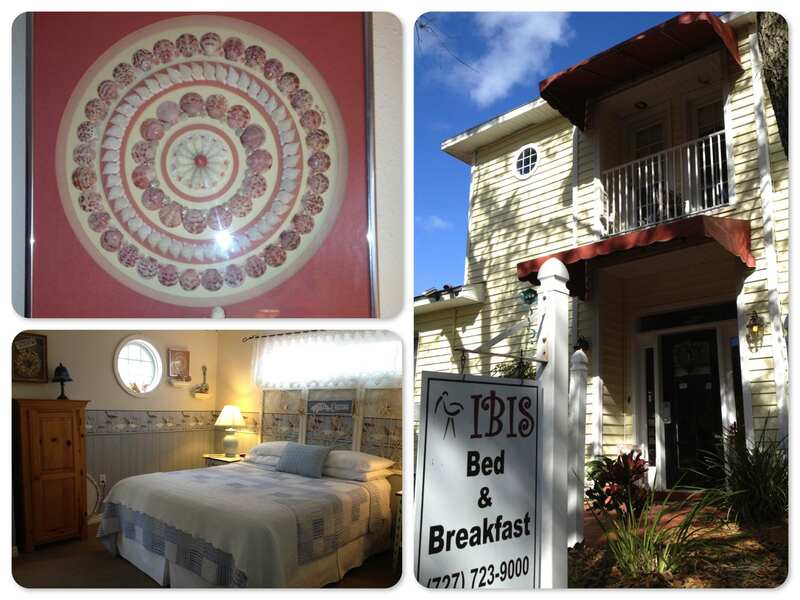 Alas, we could have stayed in Hope Town for a few days longer. Hindsight is just that – hindsight. Better to err on the safe side rather than take a chance and have conditions turn to the nasty side. 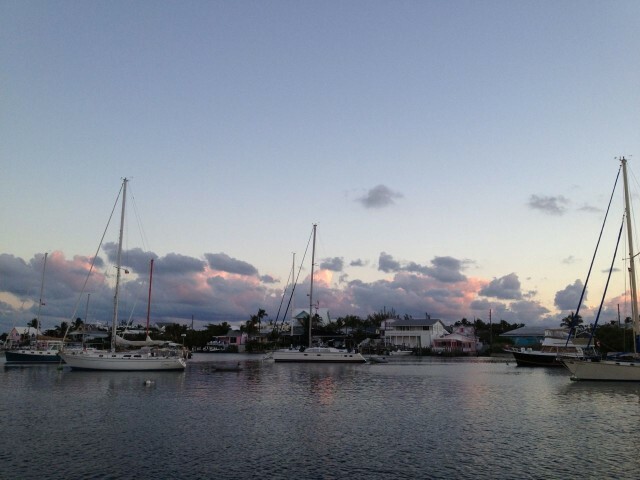 Hope Town harbor in the early morning light. One last look with my morning coffee. 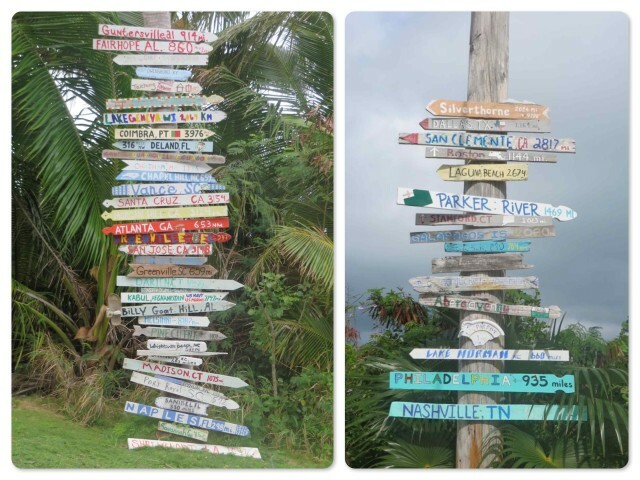 Colorful hand painted signs on the Hope Town roads – where people come from and where they return to. I guess we should have added one for ourselves. The first leg of the return trip was a 7-8 hour day, covering 44 nautical miles from Hope Town to Crab Cay, a little spit just off of the northwest tip of Great Abaco Island. We skipped Green Turtle Cay, lovely as it is, so that we could make a little more distance towards Great Sale Cay. 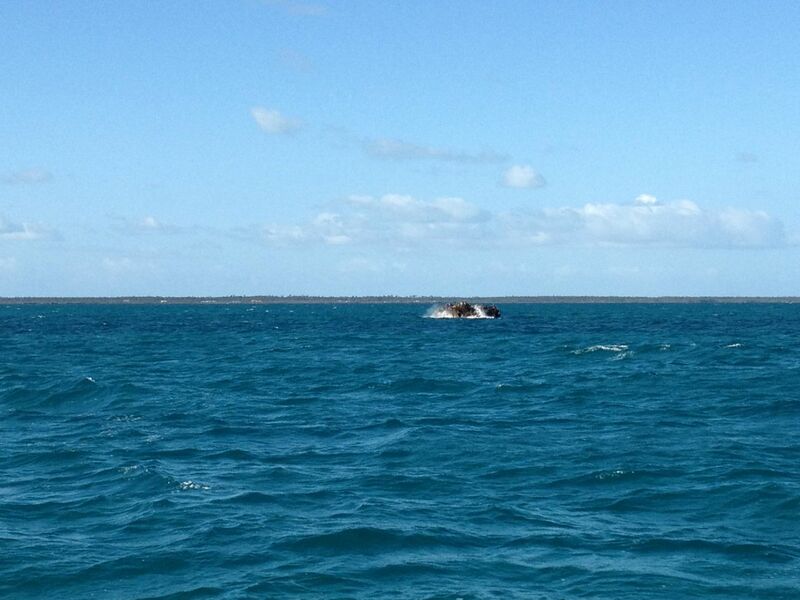 Whale Cay Passage was “a doable bouncy 4 on the scale, ” as they say during the passage reports on the Cruisers Net. 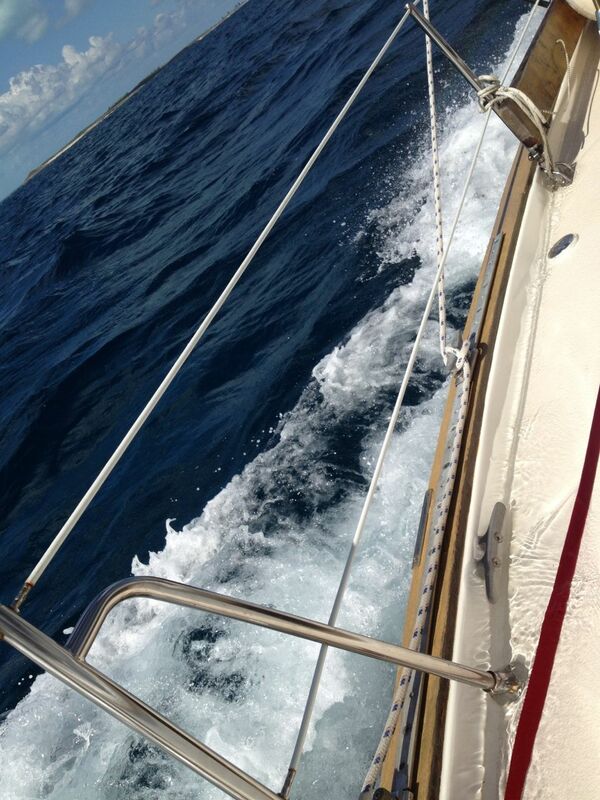 We sailed for about 3 hours, and then motored sailed the rest of the way. Crab Cay was nearly isolated (there was one sailboat anchored in the distance) and the sun was still high enough in the sky to keep things warm. 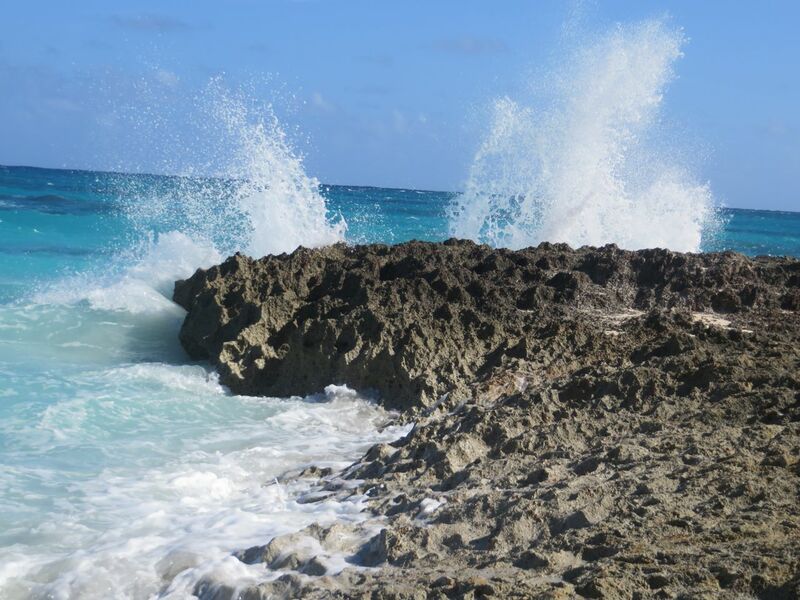 The clear blue water called us to jump in one more time! We did. 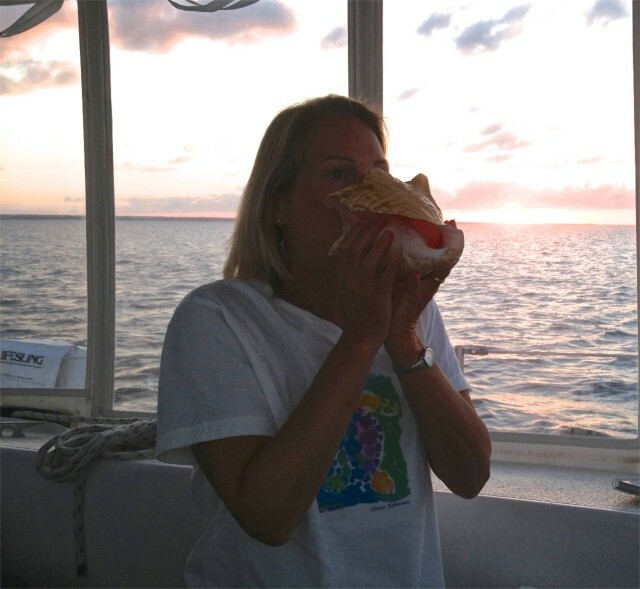 At sunset, I blew my conch horn. I am improving – really, Dan, I am! We sat in the cockpit listening to music and tried not to dwell on how much we already missed Hope Town and our friends. 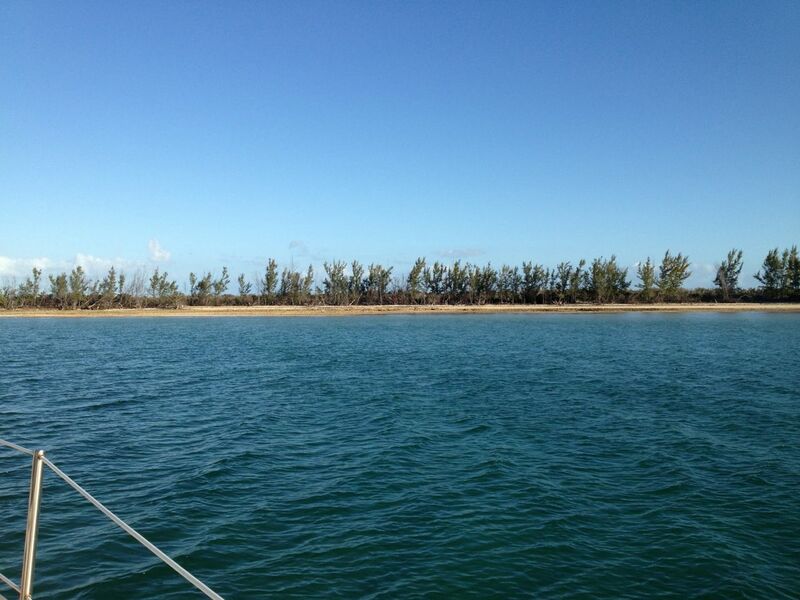 Anchored behind Crab Cay, just a scrubby little spot of an island. 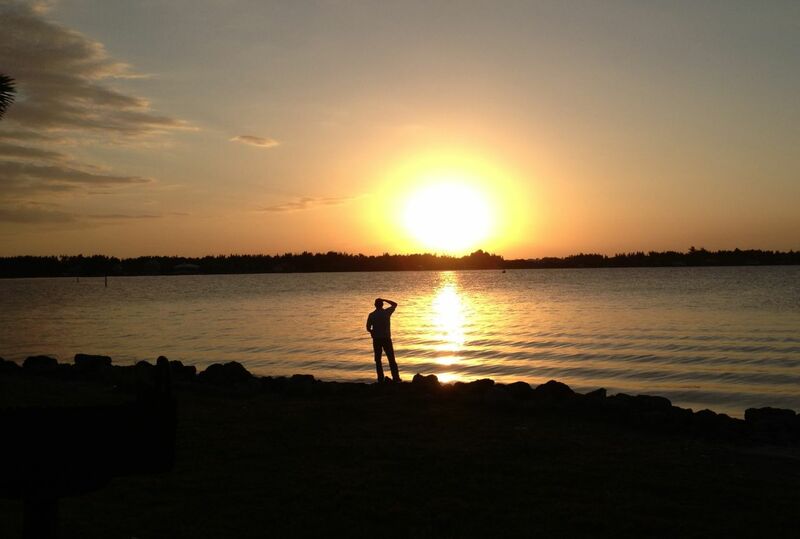 Announcing the setting sun with my conch horn. I really am improving, slowly. 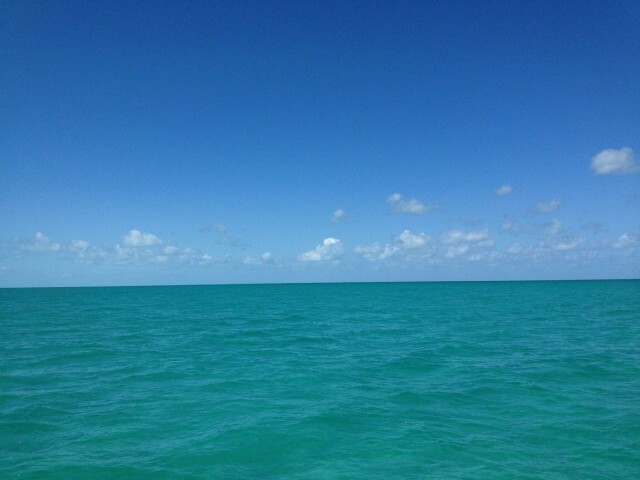 The second leg to Great Sale Cay was a more tedious day, although shorter, 35 nautical miles, 5.5 hours. Great Sale Cay is the “staging spot” for most of us who cross between Florida and the Abacos, although some folks go to West End. 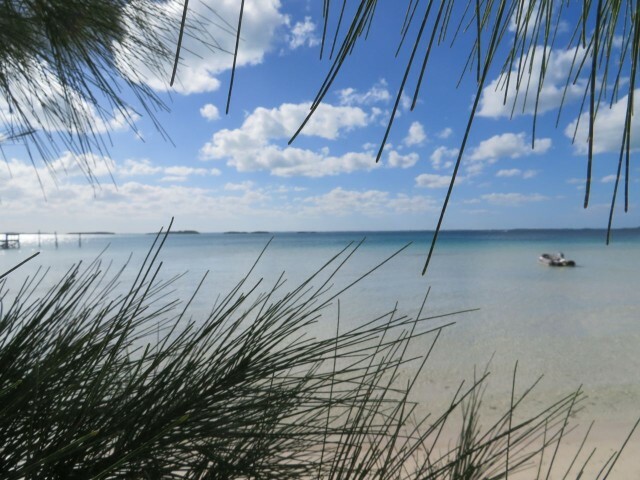 There is nothing on Great Sale, it is just an island with scrubby brush and mangroves, but this time we could actually see it because it was daytime, unlike our first crossing in December. This doesn’t’ look like much, but the chart labeled this rocky pile as “Center of the World.” I thought it was worth noting. We both wondered who had given it that name and why. Sighting of the northeast tip of Great Sale Cay. 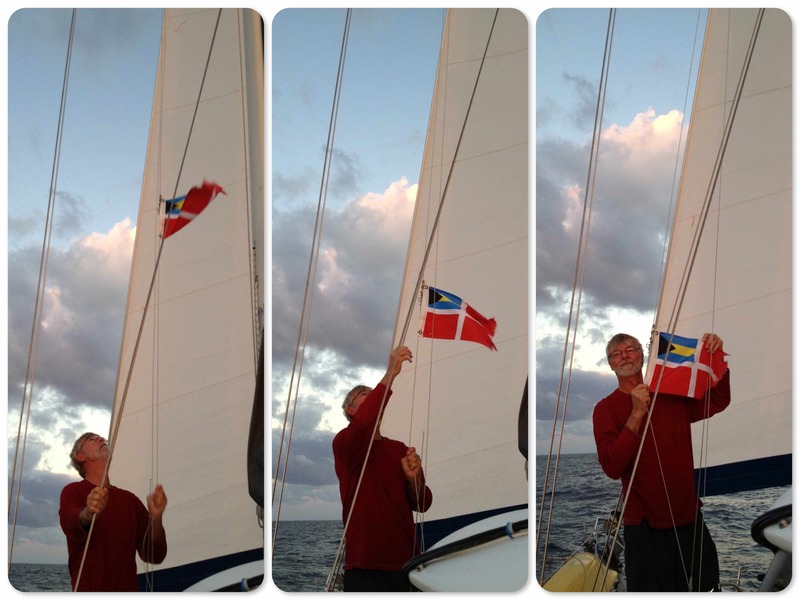 So close, but still a ways to go – you have go north of the cay and then southward to anchor on the eastern shore. 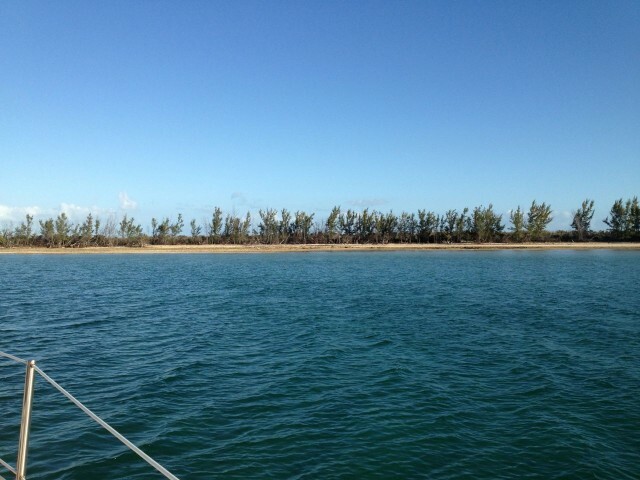 Like Crab Cay, Great Sale isn’t much of an island, just mangroves and scrubby brush. It is, however, very popular as the stopping point for staging during a crossing. 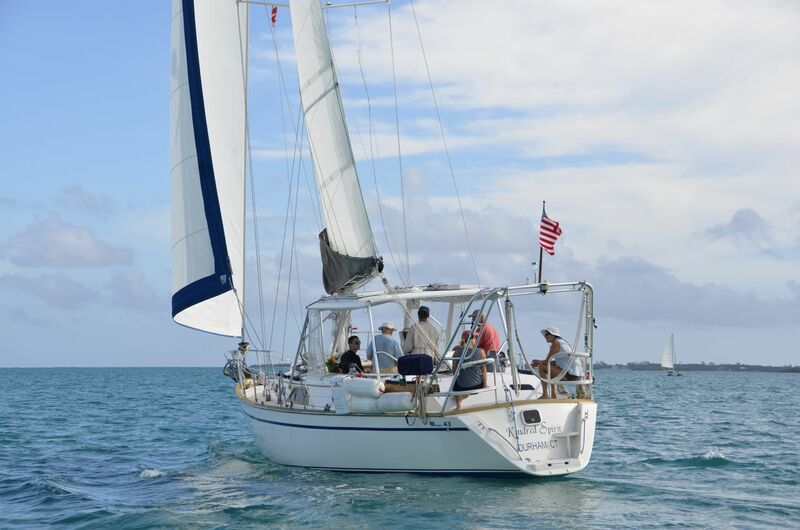 We had planned to hang there at Great Sale Cay and relax, while preparing for the longest leg, the actual crossing part. Our first plan was to leave at midnight, which we then revised to 10 pm. But the more we looked at the miles and times, combined with our possible speed (6 knot average is all goes well), the more we reconsidered. 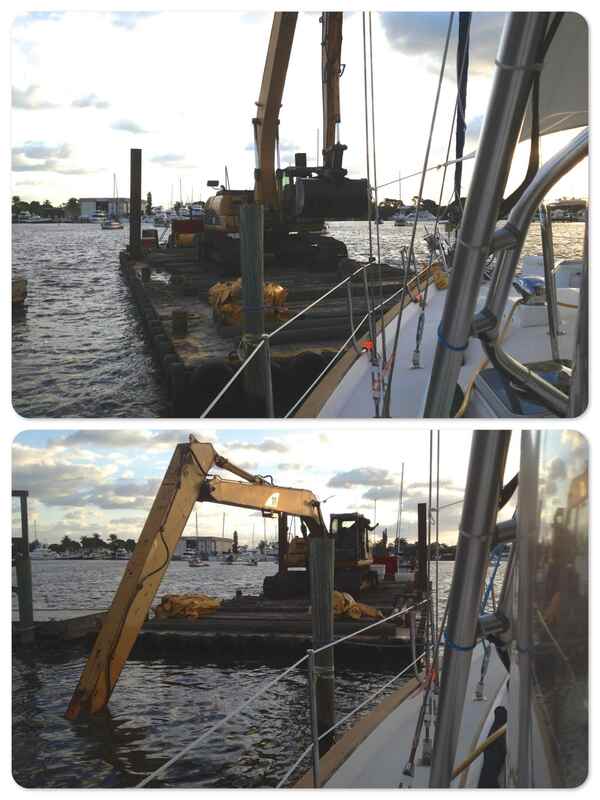 We did not want to arrive at the Fort Pierce Inlet after dark. So, after dinner, Al suggested we just leave right then before the sun sets, take our time and make some progress under sail. 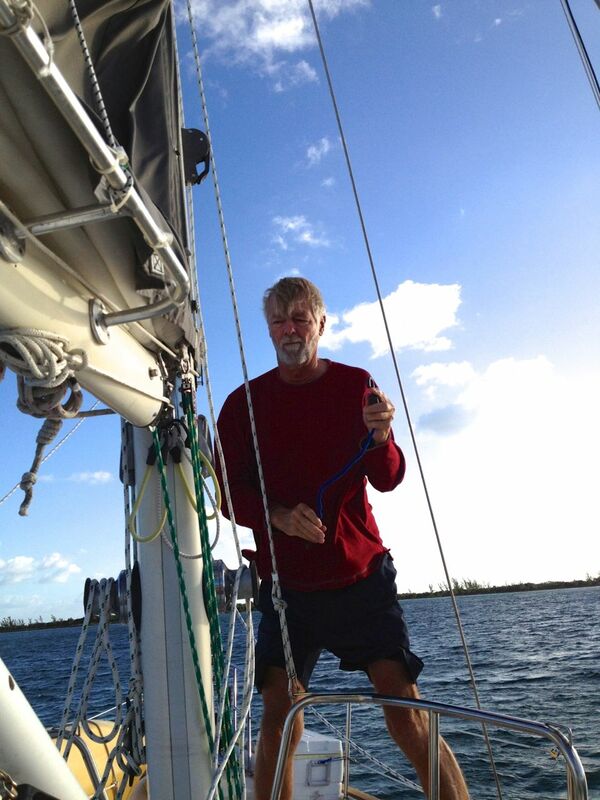 We pulled up the anchor at 6:30 pm and headed out onto the Little Bahama Banks, leisurely sailing for 6 hours at 3-4 knots. It was quiet and beautiful, very dark. 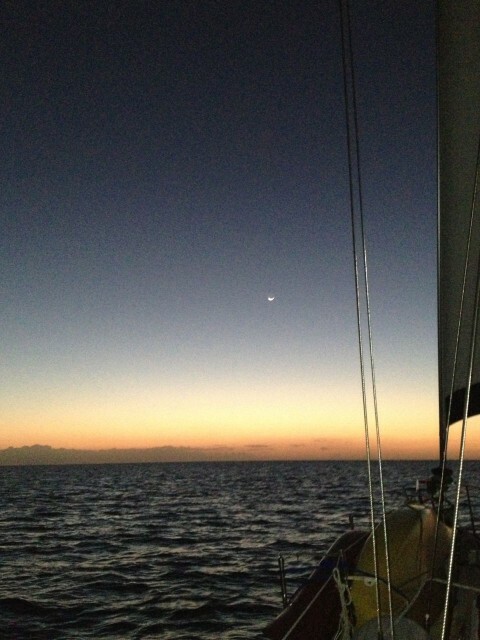 The new moon was only visible for a brief period before it sunk below the horizon. 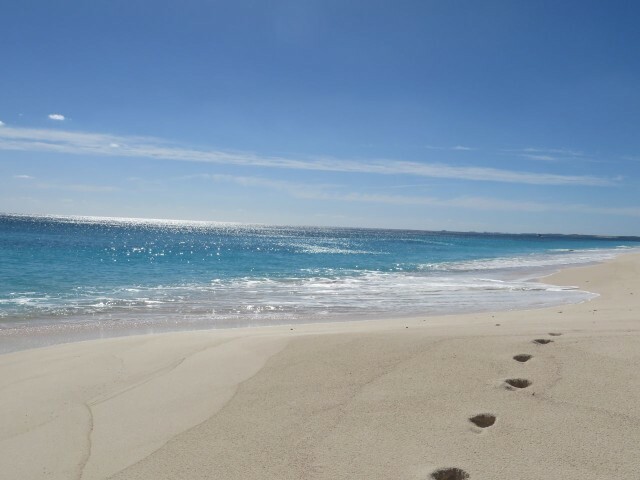 We felt as though we were the only people in the world. Al readies the main sail while I prepare the cockpit for the long journey. By 11:30 pm, we needed assistance from the engine and and began motorsailing. At 5:30 am we passed north of Memory Rock, leaving the Bahamas behind us just before the sun began to light the sky in the east. 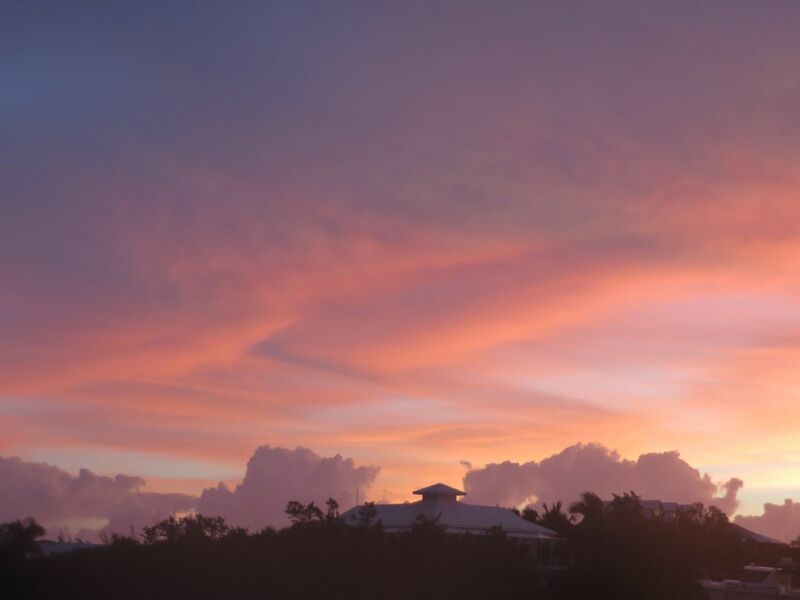 The sun rose behind us over the Bahama Banks – a sweet good bye? Once again, it seemed amazing that we could so quickly move from 15 feet of water below us to depths of over 2000 feet of water. 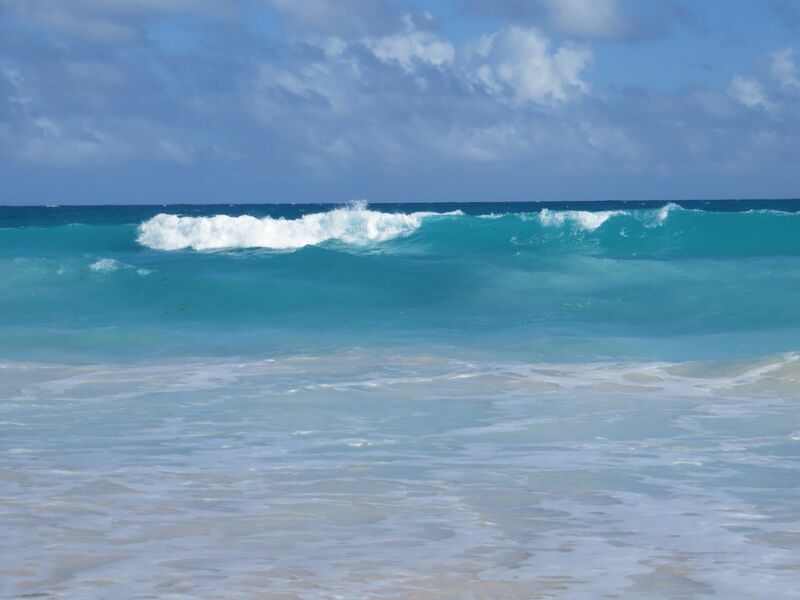 The deep sapphire color of this water was as beautiful this time as it was on our crossing in December. The crossing itself went well, although there were rolling swells that gently lifted Kindred Spirit up and down. As I looked over the photos from the 3 days of returning trip, (which, by the way, were all on my iPhone because my 2nd Canon camera died a month ago. Argghhhh!) 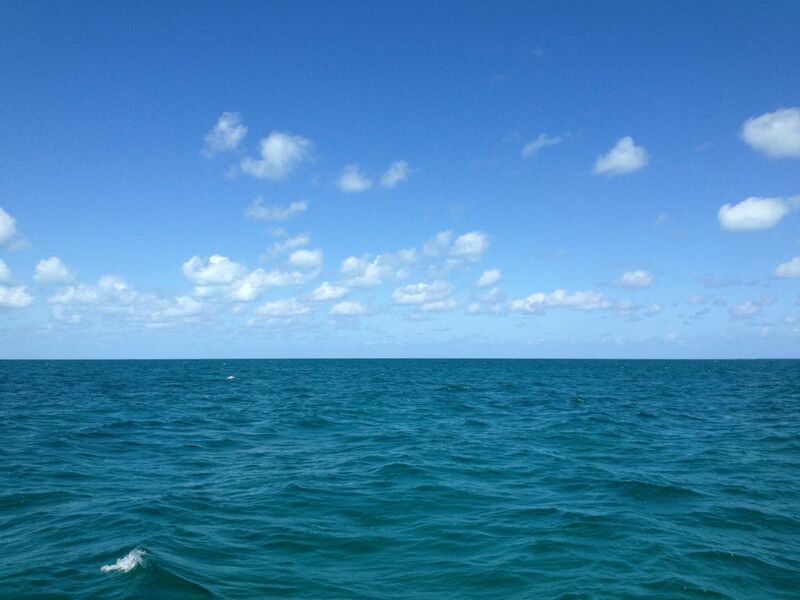 I noticed the ones where the sky and water meet, but with different hues. We never tired of looking at the horizon and the sky with nothing else in view. 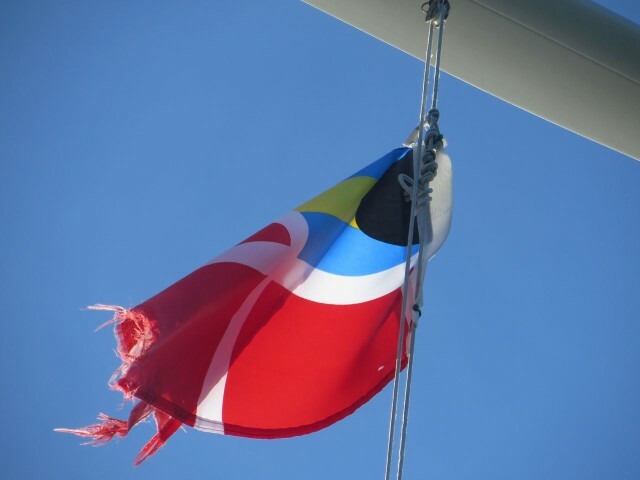 Our Bahamas courtesy flag is looking a bit ragtag after 12 weeks of wear and tear. Al is bringing down the courtesy flag, sadly. I think we will save it and treasure it as a reminder of this winter. Entering Fort Pierce Inlet was the most challenging part of the crossing. Although we checked the tides before we left, we reached the inlet during an outgoing current that created quite a washing machine effect. Al was quite proud of me that I never even flinched once this time during the entire passage through the channel. 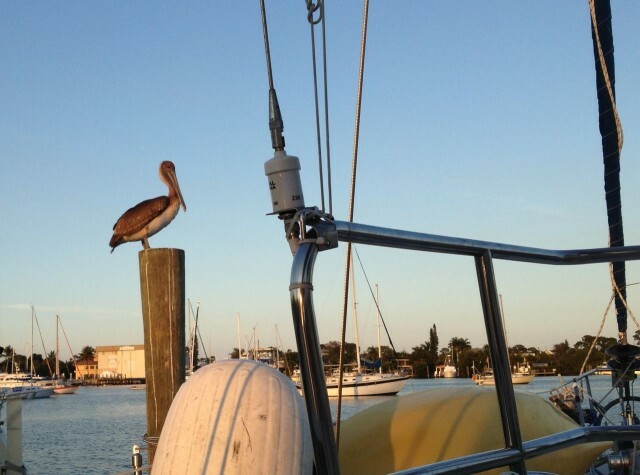 I finally learned to trust the boat, the captain, and not to worry. About time, isn’t it? 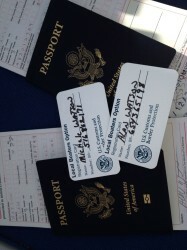 Passports and “Local Boaters Option” cards. Just a phone call takes care of customs. 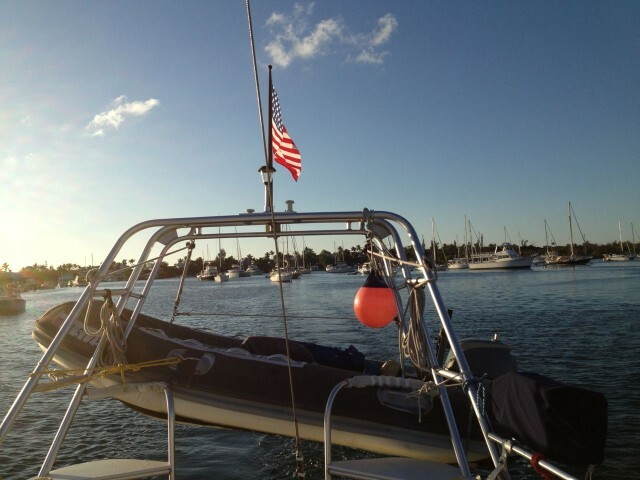 We anchored south of Causeway Island at Fort Pierce around 4:30 pm and made our phone call to clear customs. We highly recommend using the “local boaters option;” it is well worth the time it takes for the interview and trip to a customs office before leaving the US. One phone call and we were all set, as opposed to getting ourselves to land and then finding a taxi to an airport to clear customs. Who wants to go through that after an overnight passage? 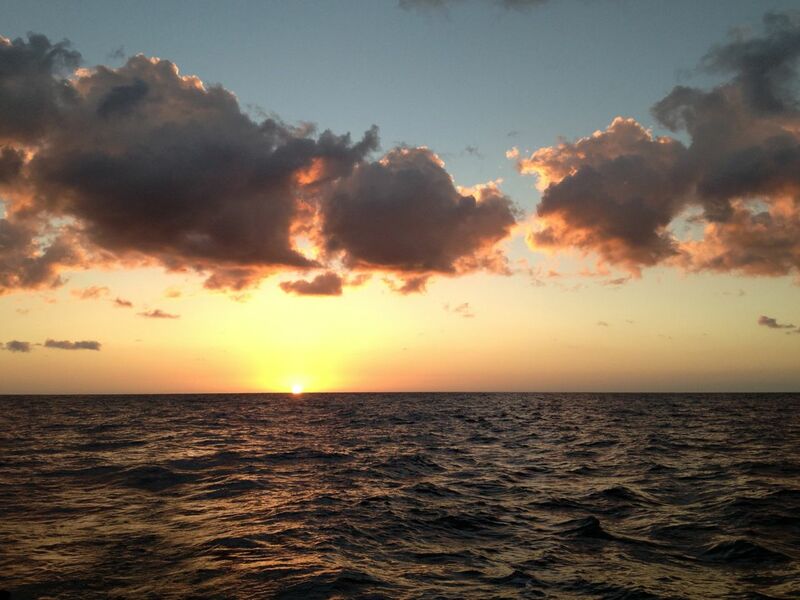 This was our first real overnight passage, 22 hours, which felt quite long to me. We didn’t really do official “watches,” just took turns and napped. I think we were both too excited to really sleep for long stretches, more like just an hour at a time. 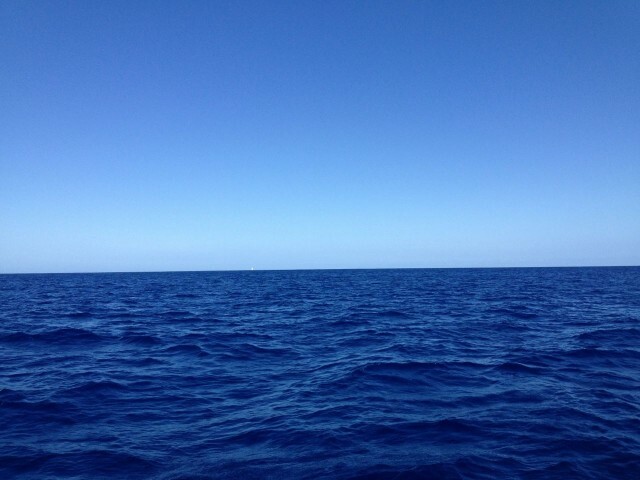 Consequently, we were quite tired by the time we anchored. 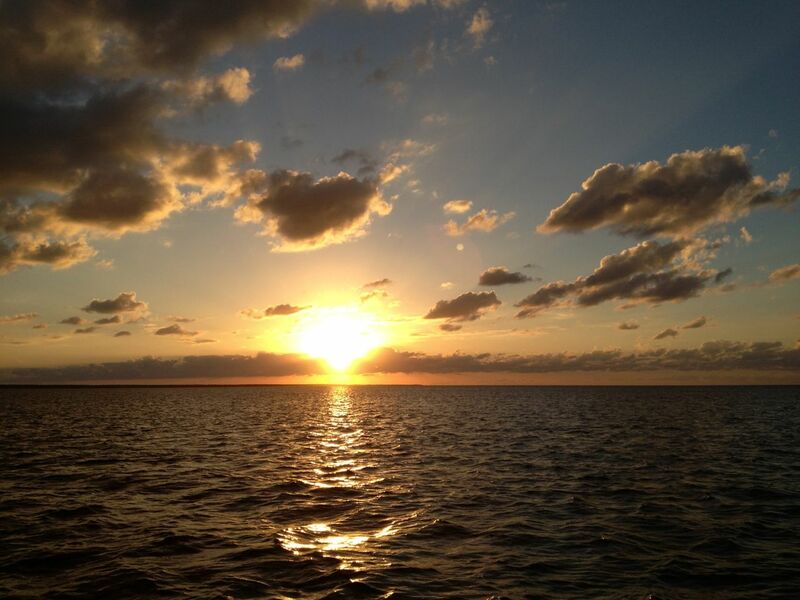 We were able to stay up late enough to see the dolphins swim by and welcome us back to Florida. “Home” is still many miles and many days away for us. The last two days of February were rainy ones, especially the 28th. I was the “weather maven” as Will now calls me, for those two days. 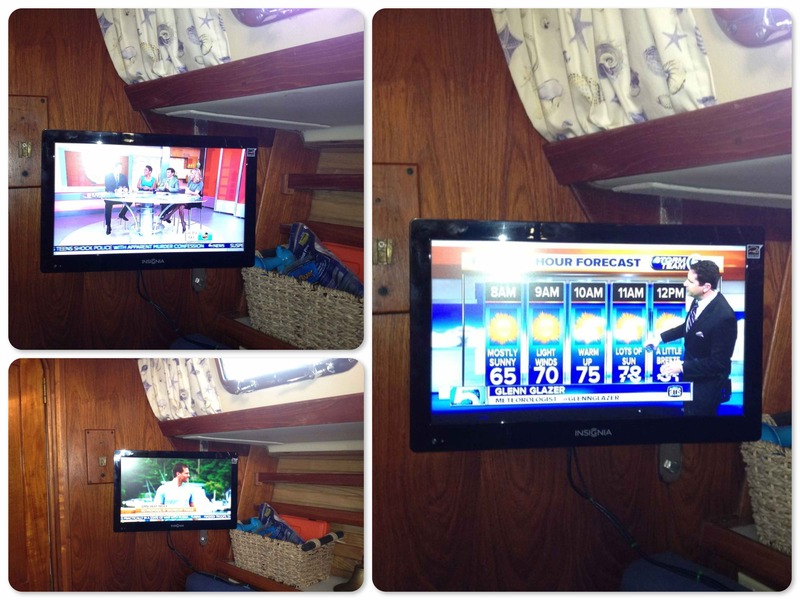 I really had fun doing the weather on the Cruisers Net. 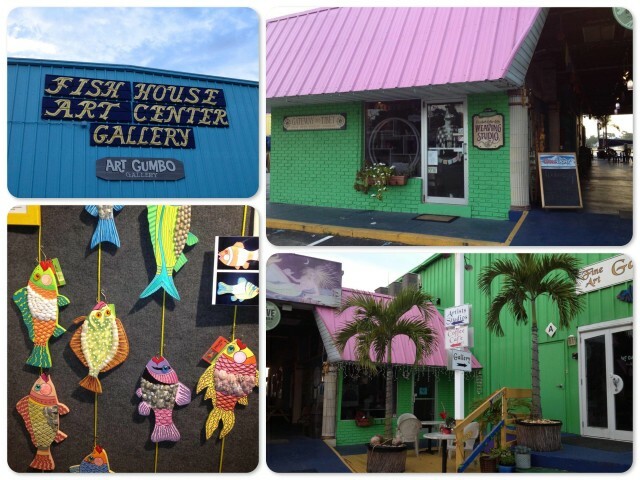 If we weren’t leaving Hope Town the next day, I might have been able to turn it into a regular gig! The rain sounded, and felt, like tears falling from the sky to echo the tears I felt building inside of me. Our departure date was Saturday, March 1st, a little earlier than expected because of the weather. It’s always about the weather when you are on a boat. It looked like there would be a good window from Saturday through Tuesday; if we miss this one we might have to delay for longer than we should. The original (way back in summer 2013) plan was to leave mid-March, but things change (and that will be another story.) 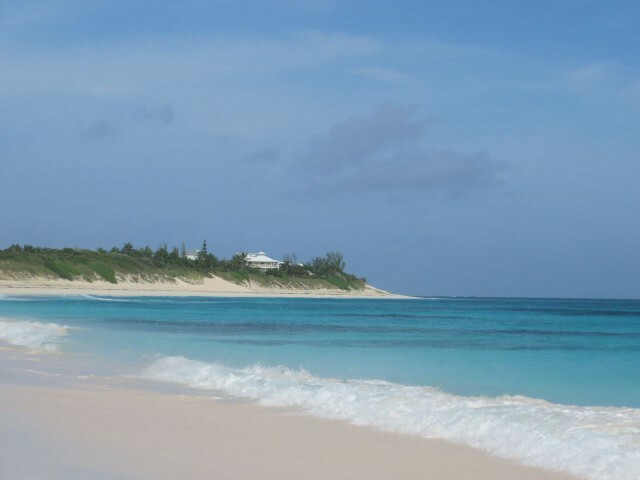 Our 90-day Bahamas permit ends next week, so all the signs are pointing to home. We spent Friday evening saying good by to many of our new, but now very dear and close friends, at Wine Down Sip Sip. 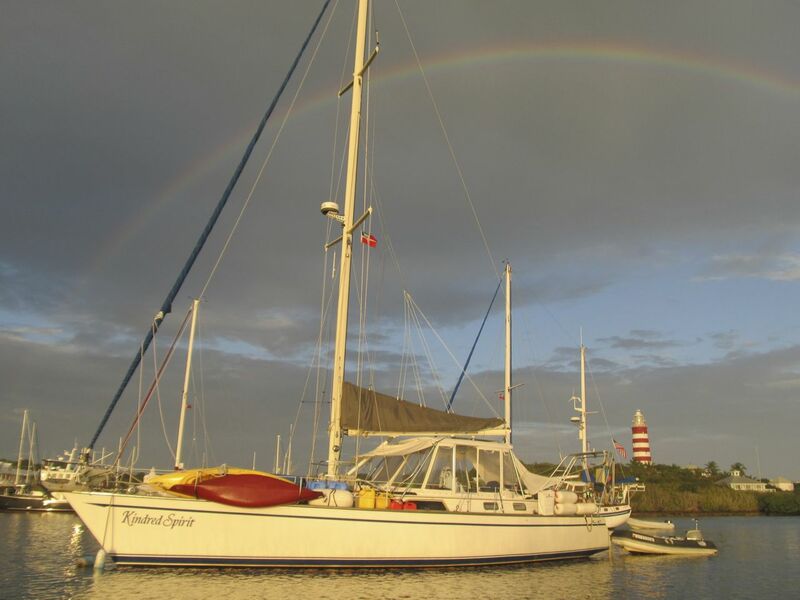 As we left Hope Town Harbor, we circled around the moorings waving good by once again as friends waved to us. There were more than a few tears shed. 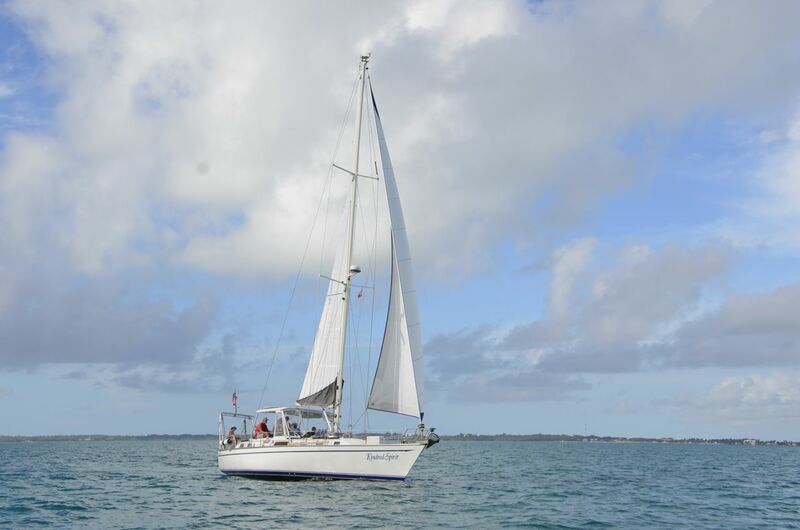 We listened to the Cruisers Net one more time as we sailed pass Man-O-War Cay. I guess we will have to listen to the audio files on Barometer Bob when we get back home, just for the memory of our morning routines in the Abaco. Somehow, I don’t think the tv network news will ever be as special to us as the Abaco Cruisers’ Net. But in the end, it is all about the people you meet. There are no words that I can write to describe that part of the journey, especially here in Hope Town. People on boats, people in homes, people in the shops and businesses. These are our very best memories. To each and every one of you – thank you for embracing us in your lives and making every moment special. We love you! 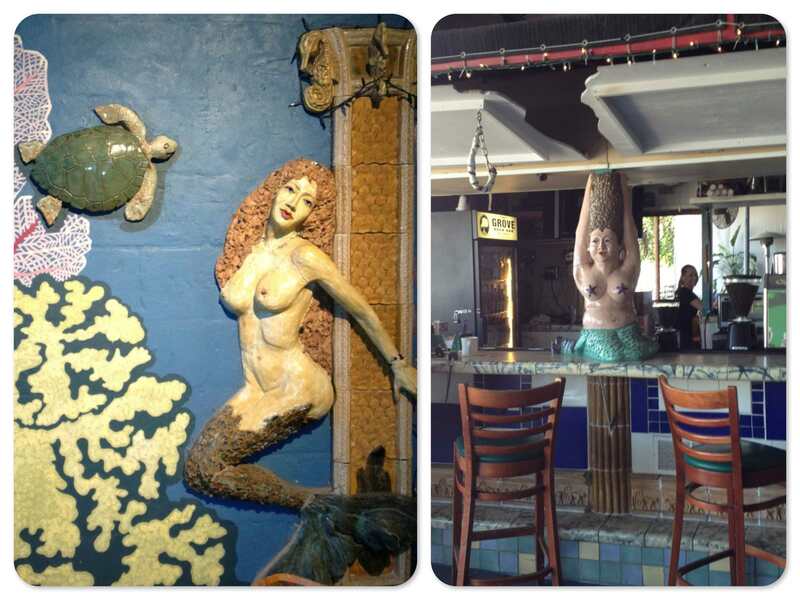 Some of our Hope Town friends. I wish I had a photo of everyone we met. 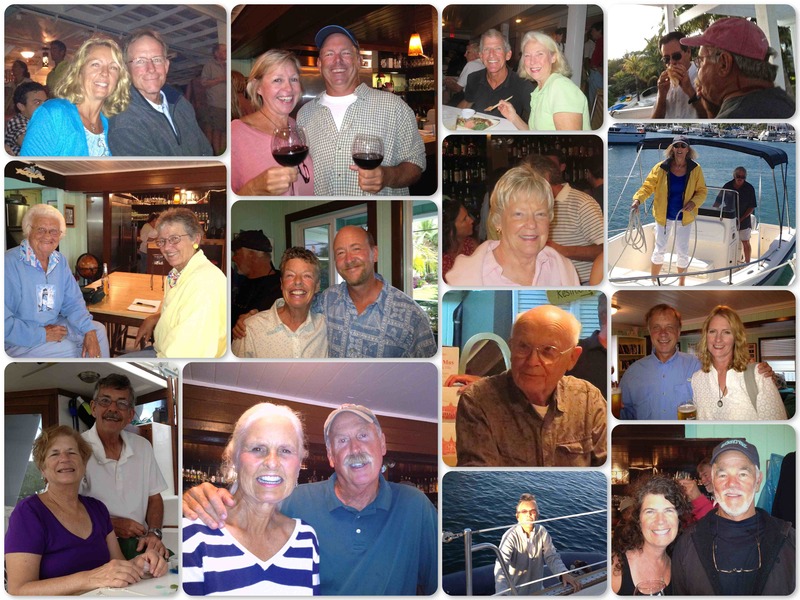 We send an extra-special thanks to Dan and Marcia, “acquaintances” from home who have now become dear friends. See you back at Shenny! 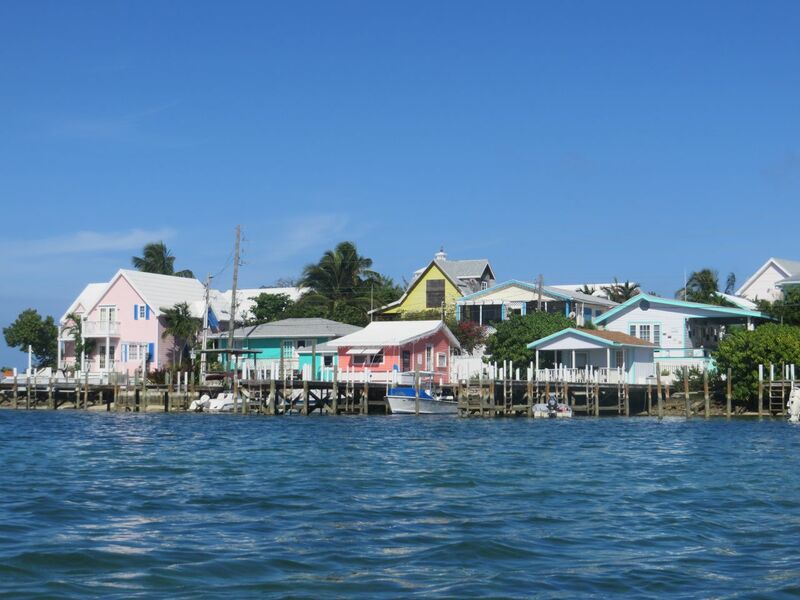 Hope Town, Abacos, Bahamas — the right place at the right time.